← Why do I get so few replies to CQ calls? I started day #169 by working a couple of Special Event stations on 40m, I worked MU/EA1SA followed by GB0GCR and GB2MOF then I had a contact with EA3PT, Jordi on 15m. I then had RTTY QSOs on 20m with TF5B, Billi and PI65ALK. It was the 6m Trophy contest and so I gave away a few points – I worked G0VHF/P, G4HRC/P, SN8B, SP7EXY, OM7KW and G5B. Late in the evening I wound up JT65 for the first time in a few weeks and worked OE1RKS, UA3IAJ and I5ADJ on 20m before ending the day talking to MX0HTJ/P operated by Mark “Jimmy” M0MJH. I hit the Special Event stations again on day #170 when I worked MS0INT, GB0BON, GB0BAB and GB5RSR on 40m followed by a chat with Walter, DK5DR all on 40m. I then switched back to 50MHz again to give away some more points in the contest and worked YT5WAW, HA8FM, YU2DX, YT5MW, YU7AR, YT1AR, YT1VP, YU7YZ, YT9A, YQ8Q, SQ9IAU and HA6NL. After that I had QSOs with another couple of Special Event stations, GB2RN onboard HMS Belfast (operated by a friend of mine who I’ve not spoken to for many years, John G1DJI), GB2POW and GB2AFG again all on 40m. I also worked EG5FUV on 20m RTTY. To finish off the evening I had data QSOs with 2E0SQL, Pete, DL1GAJ, Joachim and OZ1PMX, Peter all using the Contestia 8/250 mode on 40m. The contact with Pete was arranged following this thread on the HamRadioForum and it was fun to use an unusual mode. Day #171 had just two contacts, I worked DL0YLP, Marion on 40m and then had a RTTY QSO with IN3BJS, Gianni on 20m. 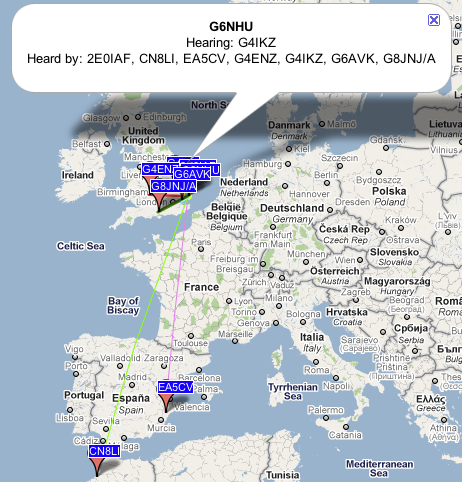 In the evening on day #171 I set up my WSPR station on 6m, not expecting much to happen but I was very pleased to be spotted by CN8LI in Morocco. All the 6m QSOs mentioned in this entry were made using my home brew half wave dipole in the loft and running 100 watts so it was good to be received in Morocco using the same aerial and just 5 watts. This entry was posted in Amateur radio, Contesting, Data, FM, JT65, QSO365, RTTY, SSB, WSPR and tagged QSO365. Bookmark the permalink.